After the Christmas party in our company, I went home directly. A night before that I haven't tasted my macaroni salad. I planned that afternoon to do the last minute remedy. Thanks to Ate Juliet by the way for providing the celery since my macaroni salad lacks green. After the last minute remedy I went to sleep. I was so exhausted from my late night cooking and the party. Anyway, I have invited three friends to celebrate Christmas with me. I told them to come by 8 P.M. and to bring some food. My best friend was the first to arrive since he would leave early for the Indonesian mass. My other two friends arrived an hour later. After we ate, I went to take a bath since my two friends invited me to go with them to their cousin's Christmas Clown party in Boon Lay. I was hesitant to go since I don't know the people in that party and Boon Lay is so far from my place. 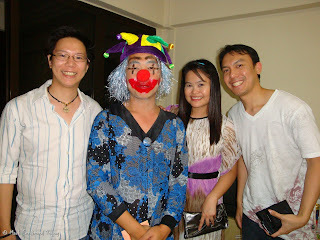 At the Clown Party, I was shocked to see them with all the make-up and costumes. We were offered drinks and food but we hesitated since we ate a lot in my place. But after 10 minutes, I asked for the pizza hahaha. Anyway, when we arrived they were voting for the Best Clown. Since it was a tie, the three of us was lucky to decide who is the winner. The winner by the way is the guy below. They did a lot of games and I was bored. There's this one lady guest in that party that annoyed me a lot. She kept on forcing us (ME!) to join the games (to sub for her actually). I planned to leave that party by 1 A.M. but my other friends were still enjoying so I just sat on the side and waited for it to be over. By 4 A.M., I told them that we should go home. My friends are so nice that they invited me to sleep in their place. I decided to just go home since it would be hard for me to sleep in an unfamiliar place. It was a 15-minute taxi ride from Boon Lay to my place. I am so lucky that the taxi driver knows my place unlike other drivers that needed directions. 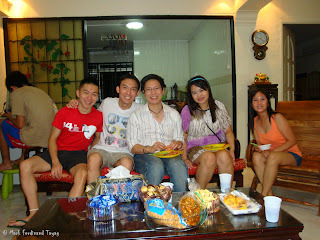 My second Christmas in Singapore is not that bad unlike last year that we just slept. I somehow felt the Christmas spirit. Belated Christmas everyone and a blessed new year! Hi sir, you got a really nice blog. A really personal one and some other things.